Serena Williams: Are female tennis players treated unfairly by umpires? The fallout from the women's US Open final between Serena Williams and Naomi Osaka has sparked debate about whether female tennis players are treated unfairly by match officials. 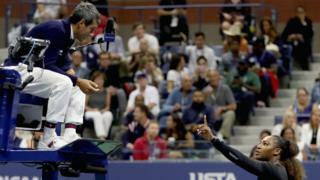 Umpire Carlos Ramos handed Serena Williams three code violations during play and she was fined $17,000 (£13,100). Williams called the umpire a liar and after the match, which Osaka won, she said it was sexist to be docked a game. The International Tennis Federation (ITF) defended the umpire and said he had followed the rules and "acted at all times with professionalism and integrity". Steve Simon, chief executive of the Women's Tennis Association (WTA), which runs the women's tour, suggested Williams had been treated unfairly. "The WTA believes there should be no difference in the standards of tolerance provided to the emotions expressed by men v women and is committed to working with the sport to ensure that all players are treated the same. We do not believe that this was done." Do any statistics back up these accusations of sexism in tennis? There are no official figures to answer one of the key questions in this debate: do umpires enforce rules for player conduct differently for men and women? But there is data that tells us how many times women and men are fined for breaking the rules. During a match, umpires give an official warning for the first violation, deduct a point for the second, and for a third infringement, dock a whole game. Violations tend to be accompanied by a fine imposed by the championship referee and the Grand Slam Committee. During the 2018 Grand Slams, more fines were given out to men. We don't have the data to test the accusation that umpires fail to punish some angry outbursts made by a man, but penalise a woman for a similar type of angry rant. During the four Grand Slam tournaments in 2018 - Australian Open, French Open, Wimbledon and the US Open - 85 fines for code violations were issued to men. There were fewer issued to women - 43. Men play more sets at major tournaments so are on court for longer and that might lead to more infractions, or give them more time to lose their cool. To account for the longer game time, you could work out how many fines were issued per set. So, take the US Open singles' tournament. Then include fines for in-play violations and exclude retirement and the time and game delay violations. In the women's singles tournament that's 11 fines in 297 sets, which amounts to 0.037 fines per set. It's very slightly lower for men - 16 fines in 460 sets, which amounts to 0.034 fines per set. So, once these factors have been taken into account, men and women were fined a similar number of times per set during the 2018 US Open. After the heated final, current and former players weighed in on the debate. Marion Bartoli, the 2013 Wimbledon champion, questioned the umpire's interpretation of the rules. "When there is absolutely no curse or verbal abuse from Serena then giving her a game penalty is insane. You can't do that. It is impossible." "She's right [Serena Williams] when she says the men say 10 times worse and don't even get a warning." But former British number one Annabel Croft didn't think Carlos Ramos was sexist, rather that he's a strict official "who takes nothing from any opponent whether they're male or female". Correction 12 September 2018: This story originally said men had been fined 21 times in 460 sets during the 2018 US Open - but this figure incorrectly included the five fines issued to men playing in doubles matches at the tournament and the story has now been amended with the correct figure.